Factory Sealed 2016 Topps Allen & Ginter Baseball Hobby Box mit 24 Packs Per Box, 8 Cards Per Pack (7 base cards + 1 mini card). Produktinformationen "2016 Topps Allen & Ginter Baseball Hobby Box MLB"
"If you build it..." Look for Kevin Costner autographs featuring him as Ray Kinsella from the baseball movie Field of Dreams! Key Rookies: Corey Seager, Kenta Maeda, Nomar Mazara, Julio Urias, Trevor Story, Max Kepler, Miguel Sano, Jose Berrios, Kyle Schwarber, Michael Conforto, Luis Severino, Aaron Nola, Gary Sanchez, Stephen Piscotty, Trea Turner, Raul Mondesi. - Short-Printed Base Cards (50 subjects) - Card Numbers 301-350. Inserted 1:2. 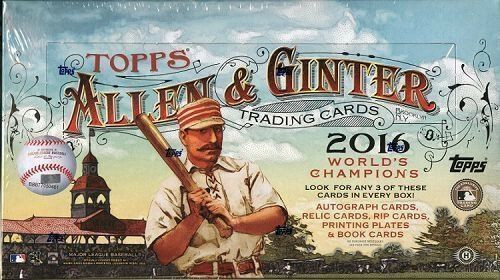 - Allen & Ginter Back - 1:5 Packs. - Allen & Ginter Black-Bordered - 1:10 Packs. - Allen & Ginter Brooklyn Back - Numbered to 25. - Allen & Ginter Glossy - Numbered 1 of 1. - Printing Plates - Numbered 1 of 1. Allen & Ginter Autographs - Signed and framed. Black Framed Parallel - Numbered to 25. Red Ink Parallel - Numbered to 10. Allen & Ginter Book Cards (Up to 50 Subjects) - Numbered to 10. HOBBY ONLY. Cut Signatures Includes political and historical figures - Numbered 1 of 1. Allen & Ginter Red Autographs - Numbered to 10. Allen & Ginter Mini Exclusives (50 subjects) - Card Numbers 351-400. - Mini Wood Exclusives (50 subjects) - Numbered 1 of 1. - Mini Metal Exclusives (50 subjects) - Numbered to 3. The Numbers Game (100 subjects) - The story behind players and their uniform numbers - 1:2 Packs. Baseball Legends (25 subjects) - Featuring the best baseball players of all time. Natural Wonders (20 subjects) - Collect the Natural Wonders of the world! Subways and Streetcars (15 subjects) - Look for famous modes of transportation in the U.S.
Laureates of Peace (10 subjects) - Winners of the Nobel Peace Prize. Box Loaders Relic - Numbered to 25. Box Loaders Autograph - Numbered to 15. Box Loaders Autographed Relic - Numbered to 5. Box Loaders Cut Signature - Numbered 1 of 1. Cabinet Relics - Numbered 1 of 1. Weiterführende Links zu "2016 Topps Allen & Ginter Baseball Hobby Box MLB"
Fanbewertungen für "2016 Topps Allen & Ginter Baseball Hobby Box MLB"